They also called for prayers for “the conversion” of pro-Russian separatists in eastern Ukraine and “for unity and independence” for the nation. The bishops said they made the appeal in unison with Archbishop Sviatoslav Shevchuk of Kiev-Halych, Ukraine, and the other Ukrainian Catholic bishops, who have asked Catholics in their country to fast and pray daily. On Feb. 12, a new cease-fire agreement was reached, offering some hope the strife would end. It was to take effect at the start of Feb. 15. Previous cease-fires have not held. Last March, Russia annexed the Crimea region of Ukraine, and pro-Russian separatists control Ukraine’s eastern regions. Ukrainian Catholics fled Crimea to escape arrests and property seizures after the annexation. 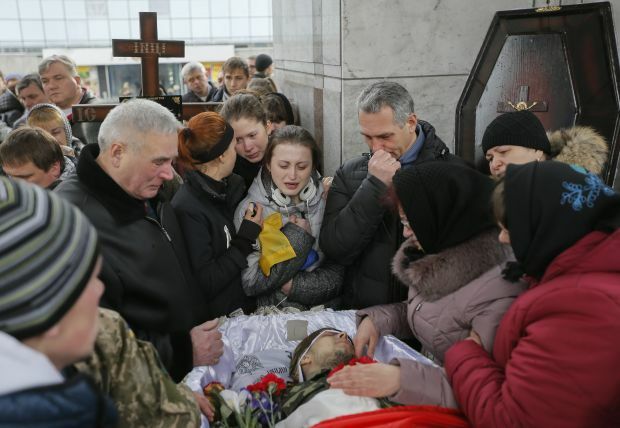 Most church parishes have closed in Ukraine’s war-torn Luhansk and Donetsk regions, where separatists declared an independent “New Russia” after staging local referendums last spring. The statement was signed by Archbishop Stefan Soroka of Philadelphia, who is metropolitan of U.S. Ukrainian Catholics in the United States; Bishop Richard S. Seminack of St. Nicholas in Chicago; Bishop Paul P. Chomnycky of Stamford, Connecticut; Bishop Bohdan J. Danylo of St. Josaphat in Parma, Ohio; Auxiliary Bishop John Bura of Philadelphia. In Ukraine, the fighting has gone on since April 2014 and has left about 5,400 dead and 1.2 million people uprooted. The International Rescue Committee said Feb. 12 it would send an emergency field team to Ukraine amid reports of rising violence in the countdown to the cease-fire. It described humanitarian needs as great. “Concerns are highest for people still residing in nongovernment-controlled areas, where basic services like power, water and access to savings and pensions have been disabled for weeks,” the agency said. “Those remaining in the conflict zone are primarily taking shelter in basements with no source of heat in near freezing temperatures. Food and medicine are also in short supply,” it added.